Alright. Here are some of our favorite activities from Mommy School this week. 1) Microwave Puffy Paint. We found the recipe and traced the original idea from HERE. This was a little bit more clean up, but the boys went crazy over it. It's like science and art, too. We mixed up the ingredients and then divided them into four smaller bowls so we could add food coloring to them. 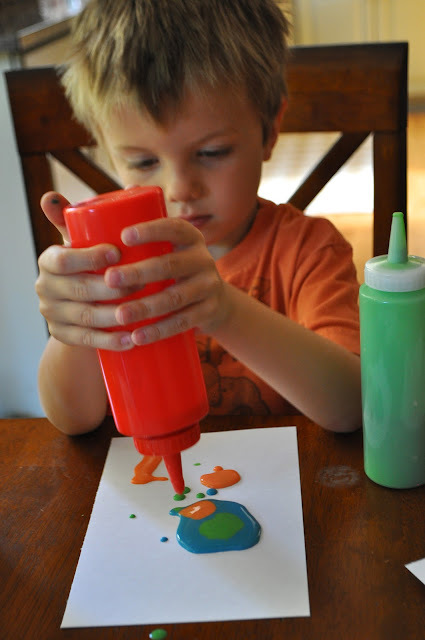 Then we put the paint into squeezy bottles. We painted, which term I'm using loosely. It was a lot harder them drawing, so the boys didn't really make any clear pictures, but they loved it anyhow. We used cardstock since paper would have been too thin for the paint. 2) We did hot rocks again. This time Baden was old enough to try it. (Last time he was really little.) We did them with the neighborhood kids, who thought it was the coolest idea ever. We originally found this idea HERE on eighteen25. All you do is bake the rocks to make them hot and then draw on them with crayons and the crayons melt as you draw. It's pretty cool. 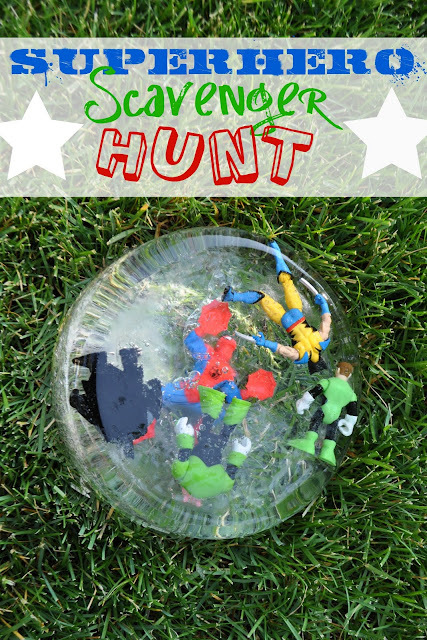 3) Superhero Scavenger Hunt. This is a repeat from a post I did HERE. That's where you can find all the details. 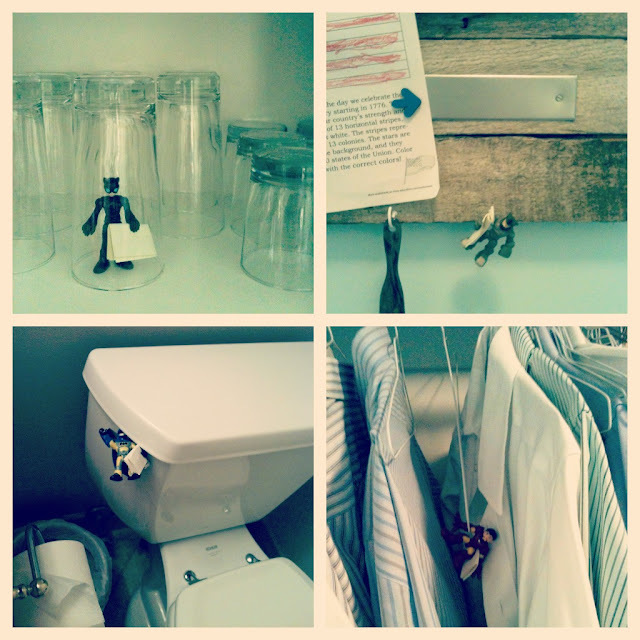 I'm not joking when I say that we've done a superhero scavenger hunt 6 times in the last week or so. Rex goes crazy over this. He loves the hunt part and ice smashing at the end as well. I've become pretty quick with writing clues and pretty creative with where I hide them. Dangling them from something is the best. Random Sidenote: My boys also willingly go to the basement to play on their own while I write the secret clues. Am I upstairs eating leftover birthday cake and taking my time while I write the clues? Perhaps :) "Are you done yet, Mom?" "Oh, not quite yet sweetheart." Ha, I'm a little evil. And that's the best of Mommy School for this week. Thanks for dropping in. - I've added a "Pin It" button to the bottom of every post so that you iPad users can pin freely and easily. 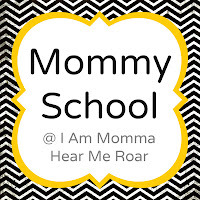 I love your Mommy School ideas. I am not a Mommy yet, but I hope to do these types of activities with my kids one day. I have been dying to figure out how to add a Pin it button to my posts! I can't read the directions in a way that makes sense!! Could you do a tutorial on it?! Pretty please???? Love it! So cute! My boys would go nuts!